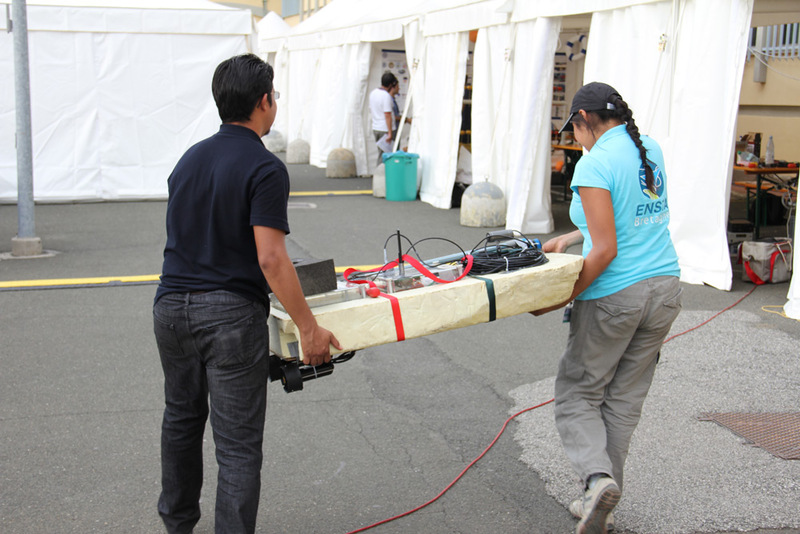 euRathlon is an outdoor robotics competition funded by the European Union with a focus on realistic cooperative mock emergency-response scenarios in three different domains: land, sea and air. On the third and fourth days of the euRathlon 2014 marine competition the teams faced two more tasks, and in the last day a combined scenario that included the tasks of the previous days. Visitors saw a demonstration of cooperation between an aerial robot and a land robot, as an advance of euRathlon 2015 Grand Challenge. 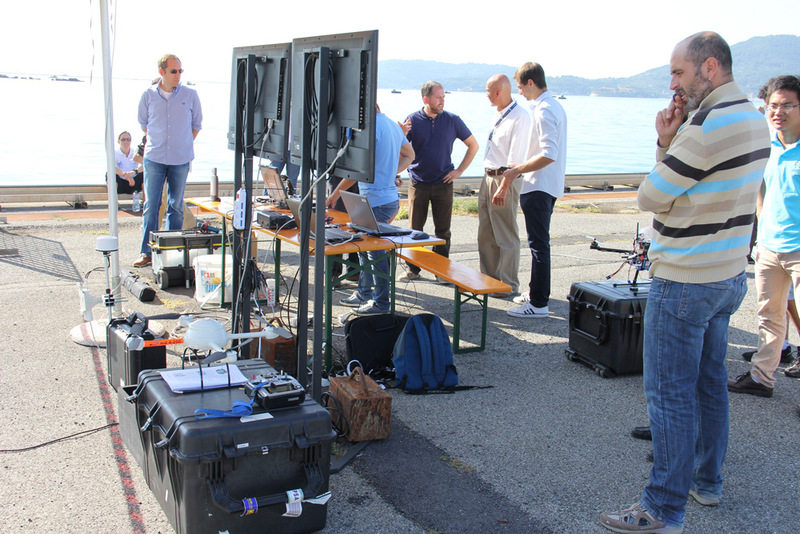 The winners of the five euRathlon 2014 scenarios were unveiled at the award ceremony in the Centre for Maritime Research and Experimentation (CMRE) in La Spezia. In this scenario the underwater robots had to reach the manipulation area where there was a piping assembly structure. In one of the pipes there was a lever to be manipulated. 1) Fully autonomous: an Autonomous Underwater Vehicle (AUV) without a cable. The AUV could communicate with an Unmanned Surface Vehicle (USV) acoustically or with the operator located on the shore. 2) Semi-autonomous: no human tele-operation. Sensory data could be received and high level commands could be sent by the operator to the AUV or the Remotely Operated Vehicle (ROV), but low-level joystick driving was not allowed. 3) Tele-operation: human tele-operation in a low-level joystick driving. The vehicle could not be connected to the shore, but could be connected to a surface vehicle that acted as a communications relay for the tele-operation. The surface vehicle in this case could be moored. In the fully autonomous robots mode, the teams had 70 minutes, for the semi-autonomous mode they had 55minutes, and for tele-operated mode they had a total of 40 minutes. Rain was present on Wednesday morning. Only three teams participated in this scenario: University of Girona, Avalon and CISSAU. Despite the rain all teams performed well and completed the scenario. Most of the teams combined full autonomy in the inspection and contact tasks, with tele-operation in the ring and stopcock manipulation. This scenario took place in a marina dock area. The robots had to complete an environmental survey of a specified area. The underwater vehicles had to inspect a wall to find an anomaly and localise a number of submerged Objects of Potential Interest (OPIs) represented by orange buoys. After completing the scenario, the teams had to download the information and create a map with the position of the OPIs. On Thursday morning the sun shone again. Two of the six teams decided to withdraw due to technical problems with the navigation of their vehicles. The four teams participating were: Avalon, SAUC’ISSE, University of Girona and CISSAU. All of them completed the scenario successfully. The wall inspection was a difficult task for most of the robots, due to the particular rounded shape created by the rocks in one of the corners of the dock area. Teams had a maximum of 60 minutes to complete this scenario and the teams had an hour more to process the data and give it to the judges. This scenario took place in the coastal water area and the marina dock area, and was a combination of the four previous days’ scenarios. It included three different tasks: “Autonomous underwater navigation”, “Mapping the area and wall following/anomaly detection” and “pick and bring to the surface the pole ring”. The scenario ended when the AUV surfaced with the pole ring object. Teams had a maximum of 75 minutes to complete the scenario. The judges on the boat and inside the sonar cabin evaluated in real time the teams’ performances. Once the scenario finished, maps with the trajectories of the vehicles and the OPIs localisations were created from the data given by the teams. Four teams participated in this last scenario: University of Girona, Avalon, SAUC’ISSE and CISSAU. All the teams performed well, especially when taking into account the difficulty of the combined scenario. Only the University of Girona and SAUCI’SSE completed the three tasks. 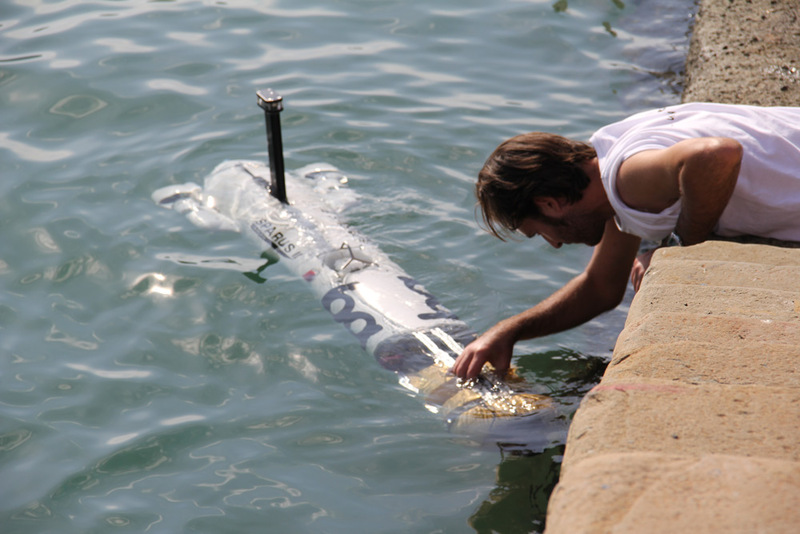 SAUC’ISSE and Avalon were able to demonstrate cooperation between a USV and an AUV. The demonstration of the cooperation between an Unmanned Aerial Vehicle (UAV) and an Unmanned Ground Vehicle (UGV) that took place on Friday offered a preview of what spectators can expect to see in euRathlon 2015 Grand Challenge. The event was held at CMRE and open to the press and public. Attendees standing behind a security line saw the cooperation between a land vehicle and a quadrotor. The demo was performed by the Centre for Advanced Aerospace Technologies (CATEC), Seville, Spain and the Scuola Superiore Sant’Anna, Pisa, Italy. 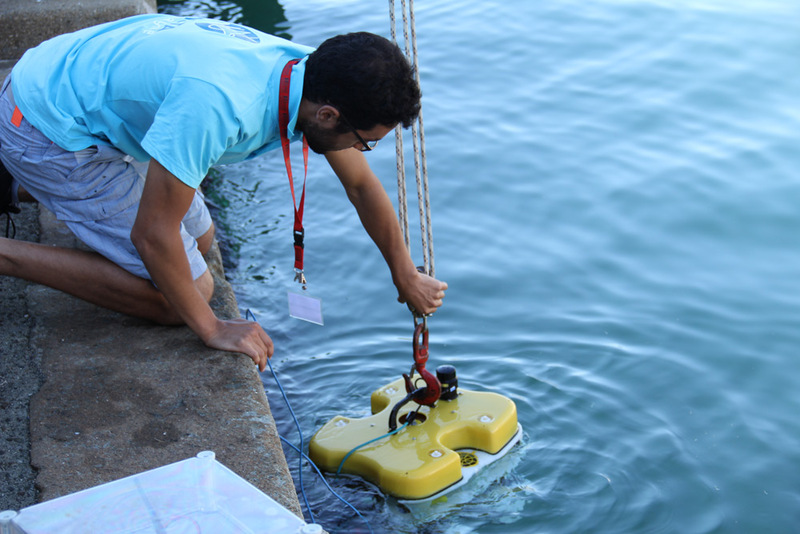 Parallel to the competition, the National Institute of Standards and Technology (NIST), challenged teams to participate in their underwater tests. The awards ceremony took place at the NATO’s Centre for Maritime Research and Experimentation. Scenario: Long range autonomous underwater navigation. At the end of the ceremony, Gabriele Ferri, technical director of euRathlon 2014, thanked the Judge Team and the Crew. The euRathlon project coordinator, Alan Winfield, thanked the teams and ONR Global, for sponsoring euRathlon 2014 prizes. He also thanked the Centro di Supporto e Sperimentazione Navale (CSSN), ECmanaged and Bq for their support and sponsorship. Teams and attendees of euRathlon 2014 were invited to participate or attend euRathlon 2015 Grand Challenge in Italy next year.